The article discusses the importance of having legal documents in place at the early stage, how much is too much when it comes to forming legal documents for a startup, and the need to customize and negotiate legal terms as a company scales. Why is legal documentation so important for startups? One may ask. And, to point out to potential pitfalls that may hinder your company’s growth from the absence of it, there are plenty of examples around us. 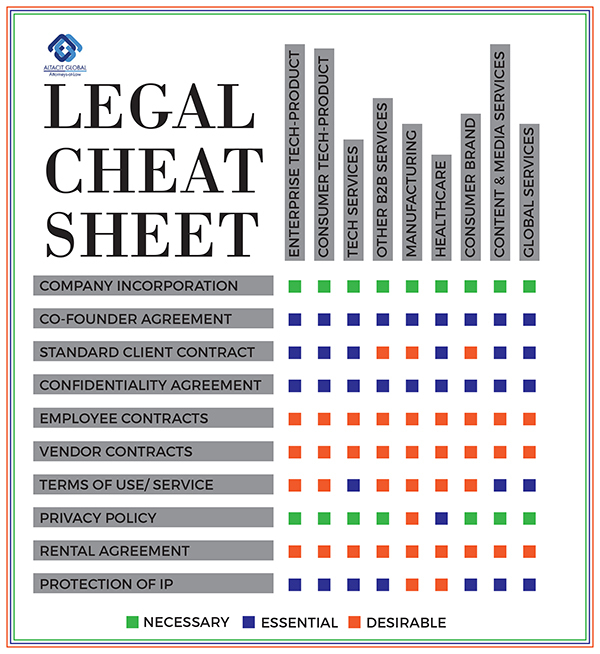 In our earlier blogs, while we had written in detail about legal issues that startups need to address at the early stage, and the nuances of having a clear legal framework and strategy in place, in this piece, we take a step back, and understand why these documents are important for startups, and how they play a key role in administering an unimpeded growth for their business. Once you, as a reader, gain an understanding of why these documents are important, don’t forget to take stock of the infographics, which can be used as a legal cheat sheet for key documents every entrepreneur must have at the early stage. The infographic (Fig.A) has been designed in a way that it defines the key (legal) requirements of each sector on three scales; necessary, essential or desirable. Of course, as your company grows, the requirements may vary but for an early stage entrepreneur, this can be a steal! Before we delve into the need for legal documents, let’s first look at the common mistakes founders usually commit, when it comes to forming legal documentations. Constructing documents which may not be suited for their business, or what in other words can be called a DIY agreement. Postponing putting together of critical agreements to a later date. Inadequate processes and systems protecting a company’s IP. Skipping implementation of preliminary IP checks and protocols.